The Ernest Hemingway Key West House, or as it is officially known "The Ernest Hemingway Home and Museum", was where the famous author decided to put down roots. And what better place to set up camp than on the island of Key West, down in the amazing Florida Keys. 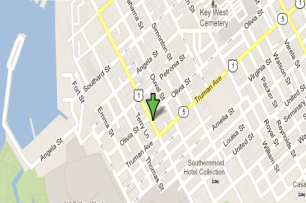 You can see from the map below, where the green arrow points to the exact location of the Ernest Hemingway Key West House, that it is a about midway across the island. Although we can do better than that, and tell you exact walking times. With the Gulf of Mexico on one side, and the Atlantic on the other you will be walking about 7 minutes from the Southernmost point marker, (that iconic multi-coloured buoy that the tourists love), and from Mallory Square home of the Sunset Celebration it will take about 14 minutes. So not too far at all, but then again sometimes it can be a bit hot as you stroll along, so an air-conditioned taxi might do just the trick. What Makes It Worth Visiting The Museum? 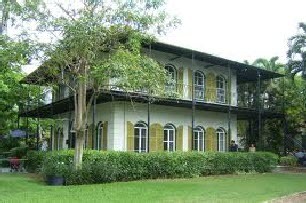 Ernest Hemingway Key West House is the number One Key West attraction. Actually one of the things that draws people to the Keys are tales of Ernest Hemingway Florida Keys adventures. The boxing, the drinking and of course the writing. But what will you find when you get to the place itself? The property that Ernest called home. Well you will find a home of character and history, and undoubted charm. Originally the house was designed and constructed in 1851 by Asa Tift in the style of a colonial southern mansion. The limestone that it was built from actually quarried directly from the site. And they must have really made it well, as it has been pounded by numerous hurricanes and pretty much survived everything that nature can throw at it, which is lucky for us. But really it is all about the chap who lived here between the years of 1931 and 1939 that makes the house the tourist attraction that it is today. 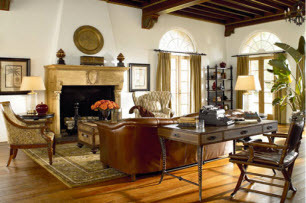 Ernest wrote a selection of his finest works, within the four walls of his home in the Florida Keys. Works like "A Farewell to Arms," and the classic collection of short stories such as "The Short Happy Life of Francis Macomber" and "The Snows of Kilimanjaro". Hemingway's personal touches are still seen throughout the house , as a lot of the unique and I suppose somewhat strange furnishings are antiques that Ernest collected during his many European adventures. The animal heads up on the walls, and the skins hung around the place were souvenirs of his time amongst the wildlife of the African serengeti. Some might say nowadays that it is in bad taste, but whatever your opinion you are certainly left with the impression that Ernest Hemingway was passionate about his hunting and shooting trips. 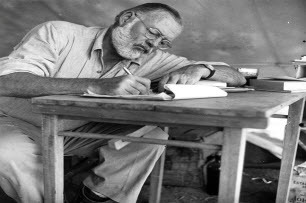 It is when you step into the studio near the pool where he did his writing, that the ghost of Ernest Hemingway can be felt most strongly. You can almost see and him developing a story line, or working on a new character. Deep In Thought, So Don't Disturb Him Now! Whats The Thing About The Cats I Keep On Hearing About? When you visit the house you will see hopefully the rather strange six toed cats that hang around the place. The tour will tell you more about them, but basically Ernest loved cats. He thought of them as having the same kind of personality and freedom seeking spirit as himself. 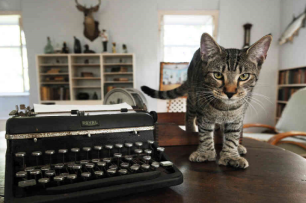 So when Ernest Hemingway Key West love affair first started, he took possession of a six toed cat from a captain of a ship that was moored in town. How Long Do I Need To Give Myself If I Decide To Visit? Although the house is basically a memory of someone famous, there are quite a few tales that will be told as you walk from room to room. However, it is still a home so you probably wont expect to be there more than an hour. Though if you fancy asking the informative guides about Ernest Hemingway Key West adventures, I'm sure you can really get your moneys worth and pad it out further than the normal lengths. In my experience guided tours will last just over 45 minutes, and will commence every ten minutes, so you wont be waiting for long before you get going. How Much Does Entering The Ernest Hemingway Key West Home Cost? Children up to five years old may enter free, whilst the rest of us will pay $13.00 dollars as an adult or $6.00 as a child. If there is a few of you then presently it is $10.50 for group or rtes. Although we keep the information as up to date as possible, pleas make sure using the links provided to double check, and even to book your tickets before visiting the Ernest Hemingway Key West Home And Museum. Ernest Enjoying The Cats....Make Sure They Don't Scratch You! What Are The Opening Hours Of The Home? Amazingly even if you fancied on visiting the home on Christmas day you will find it open. So there are plenty of opportunities to pop in whilst you are visiting Key West, but like most tourist attractions you will find it gets busier as the day goes ons, so I would suggest trying to get there as early as possible. EXCLUSIVE! See the best of Key West, in chilled out luxury...and then visit the home of Key West's world famous author. The Old Town Trolley and Ernest Hemingway Home and Museum package is a one of a kind excursion that is sure to inform and inspire. Whilst Ernest lived in Key West, he didn't just stay indoors writing his books, and stories, but made the most of the social life too. So each March in July, on our famous writers birthday, his favorite bar in Key West Sloppy Joes, holds a look a like competition which is great fun. 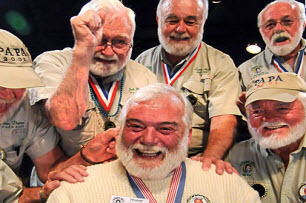 Some of the best bearded men in the world (and to be honest some of the worst too) converge on this drinking joint to be crowned the greatest doppelganger to the main man. So if you are thinking of having a true Ernest Hemingway Key West adventure, then this would a great place to visit straight after the house. simply by clicking the link above!